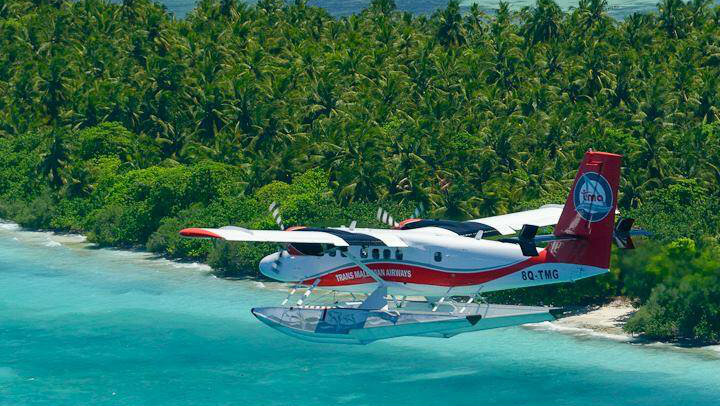 The civil aviation authority is yet to determine what caused a Trans Maldivian Airways (TMA) seaplane to crash land near the Kuredhu Island Resort last week. The accident investigation coordination committee said in a statement last night that the investigation will continue once the seaplane is resurfaced. The coastguard, police, and TMA are assisting the investigation. The Twin Otter seaplane sank within minutes of crash-landing around 5:30pm last Tuesday. A speedboat rescued the 11 tourist passengers and three crew members within minutes. The investigation committee said it has retrieved the seaplane’s records, recovered some of the seaplane’s parts with help from the army, and interviewed passengers and crew. The MNDF and TMA have made a plan to recover the submerged seaplane, the committee said. Seaplane accidents are rare in the Maldives. In February 2012, an Maldivian Air Taxi aircraft crash-landed on the water runway at Ibrahim Nasir International Airport with nine passengers due to poor weather conditions. None of the passengers or crew sustained injuries. A TMA flight crash-landed near Biyadhoo Island resort in February 2011. The tax authority has removed a freeze on Jumhooree Party leader and tourism tycoon Gasim Ibrahim’s Villa Group accounts in yet another indication of a thaw in relations between the opposition and the government. A senior government official told Minivan News that the Villa Group had submitted a plan to pay the US$90.4million claim within two years. “The Villa Group initially denied that had to make any payments. But now Villa Shipping has agreed to pay the government. That’s why MIRA [Maldives Inland Revenue Authority] has removed the freeze,” they said. MIRA froze the accounts of Villa Shipping and Trading in May after the Tourism Ministry annulled several agreements on properties leased for tourism development and claimed the company had failed to pay rents on some of the properties since 2006. The 90.4million claim includes US$75.5million as a fine. 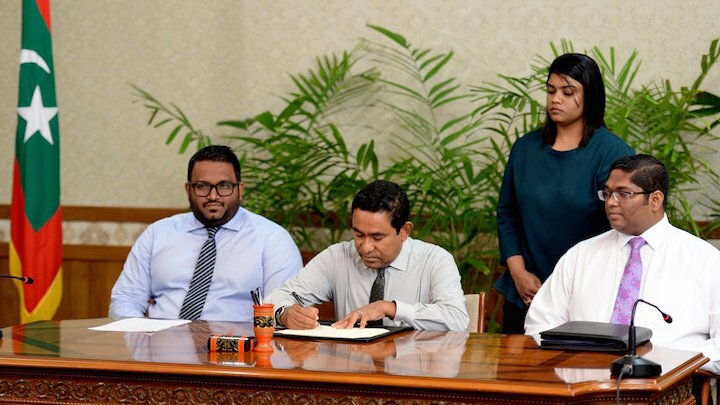 The opposition says the move was an act of reprisal after Gasim’s JP split from the ruling coalition and allied with the Maldivian Democratic Party (MDP) in an anti-government campaign. Several opposition politicians including ex-president Mohamed Nasheed was arrested and sentenced to jail shortly after the formation of the new alliance. After months of street protests, historic anti-government marches, and mounting diplomatic pressure, Nasheed was transferred to house arrest in late June and preparations are now underway for talks. Speaking to Haveeru today, Gasim maintained that his company did not owe any money to the state, but said he had no choice but to make the payment. “We are having to do this this because our cases at the courts are still pending. We had no choice to do this until the court reaches a decision. If there is any justice in Maldives, I am sure I would not have to make the payment,” Gasim said. The Villa conglomerate – which operates businesses in shipping, import and export, retail, tourism, fishing, media, communications, transport and education – previously said the claim is unlawful and is contesting it at the civil court. The civil court had rejected a request for a stay order on paying the fine until the courts uphold the claim. Villa Group says the claim has cost the company a US$80million loan. It had struggled to pay the salaries of some 5000 employees following the accounts freeze. In mid-June, Gasim announced that he will retire from politics once his term as Maamigili MP expires in 2019. The long-time presidential hopeful also said he will no longer contest in presidential elections. The government with opposition backing has now amended the constitution to set new age limits of 30-65 years for the presidency, meaning Gasim will be ineligible for the 2018 presidential elections. He will be 66 then. The JP is in disarray. Two senior party officials fled the country after they were charged with terrorism over a historic anti-government protest on May 1. Government revenue declined by MVR19.2 million (US$1.2 million) in May compared to the same period last year and reached MVR1.2 billion (US$77.8 million), the central bank has revealed in its monthly economic review. Total expenditure during the month meanwhile rose by MVR104.9 million (US$6.8 million) and amounted to MVR1.5 billion (US$97 million). “The decline in total revenue during May 2015 was mainly due to the decline in both tax and non-tax revenue which fell by MVR9.5 million and MVR1.7 million, respectively,” the review stated. In May, the government obtained US$20 million from Saudi Arabia for budget support. 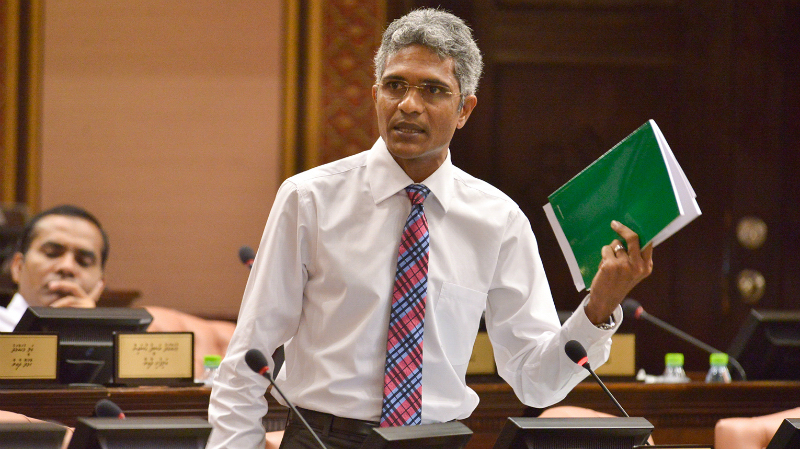 Finance minister Abdulla Jihad told Minivan News at the time that the funds were to be used to “manage cash flow” as revenue was lower than expected. A large portion of forecast revenue is expected later in the year, he said, adding that shortfalls are currently plugged through sale of treasury bills (T-bills). 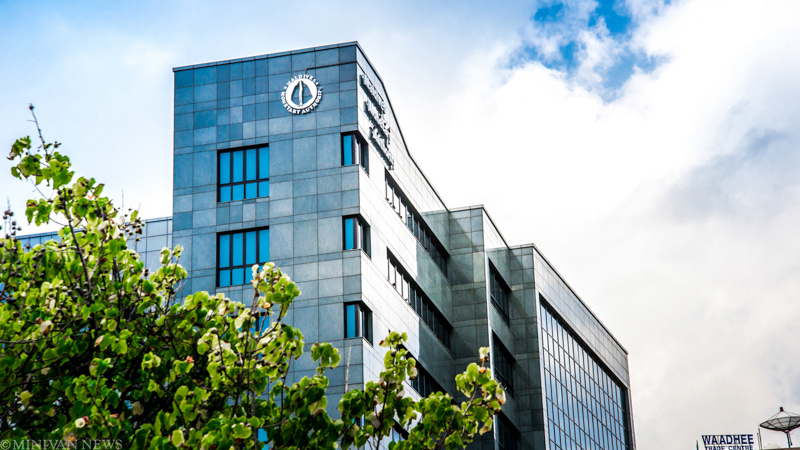 According to the Maldives Monetary Authority (MMA), the total outstanding stock of government securities, including T-bills and treasury bonds (T-bonds), reached MVR18.4 billion (US$1.1 billion) at the end of May, representing an annual increase of 36 percent. The forecast for government income in this year’s record MVR24.3 billion (US$1.5 billion) budget is MVR21.5 billion (US$1.3 billion). The projected revenue includes MVR3.4 billion (US$220 million) anticipated from new revenue raising measures, including revisions of import duty rates, the introduction of a “green tax”, acquisition fees from investments in special economic zones (SEZs), and leasing 10 islands for resort development. “During the review month usable reserves also registered increases in both monthly and annual terms by 12 percent and 41 percent, respectively. As for gross reserves in terms of months of imports, it rose both in monthly and annual terms and stood at 4.2 months at the end of May 2015. The economic review noted that tourist arrivals declined by three percent in April compared to the same period in 2014, reaching a total of 102,242 guests. “The annual decline in arrivals was contributed by the significant decline in tourist arrivals from Europe,” the MMA observed. Tourism receipts also decreased by four percent in the first quarter compared to the corresponding period in 2014. “On the supply side, the operational capacity of the tourism industry increased by 3% when compared with Q1-2014 to reach an average of 27,827 beds. Reflecting this and the decline in tourist bednights, the occupancy rate of the industry fell to 79 percent in Q1- 2015 from 84 percent in Q1-2014,” the bulletin stated. The volume of fish purchases meanwhile decreased to 6,134.6 metric tonnes in April, registering an annual decline of 11 percent. “In May 2015, both the volume and earnings on fish exports declined in annual terms by 35 percent and 12 percent, respectively. This was mainly owing to the decrease in the volume and earnings of frozen skipjack and yellowfin tuna exports,” the economic review revealed. The rate of inflation in Malé meanwhile accelerated to 1.7 percent in April from 1.1 percent in March. “The pick-up in inflation during the month was mostly contributed by the growth in fish prices and prices charged for housing rent,” the central ban explained. The government has revealed plans to develop the recently closed Nasandhura Palace Hotel on the waterfront of Malé as a 15-storey luxury hotel with apartments and a convention centre. Speaking to Minivan News today, deputy tourism minister Ibrahim Lirar said Nasandhura will be re-developed as a five-star city hotel by Galaxy Enterprises – a company owned by President Abdulla Yameen’s brother-in-law Mohamed Manik. “The company is going through all the design phases, which then has to be approved from the tourism ministry before they can start construction,” said Lirar. 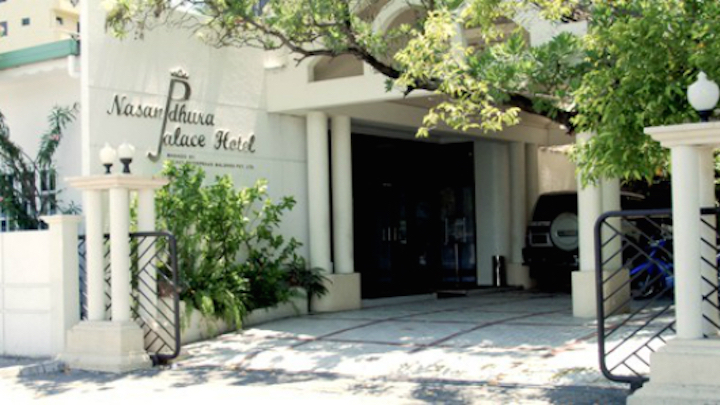 Nasandhura Palace Hotel, located in front of the airport ferry terminal, first opened in 1981 and was managed by the government. The site was previously handed to Shangri-la in May 2008 to develop a 15-storey hotel, before a crack in the coral reef outside the area doomed the project. Shangri-la was provided land near Dharubaaruge to develop the hotel, but the project has since been stalled. 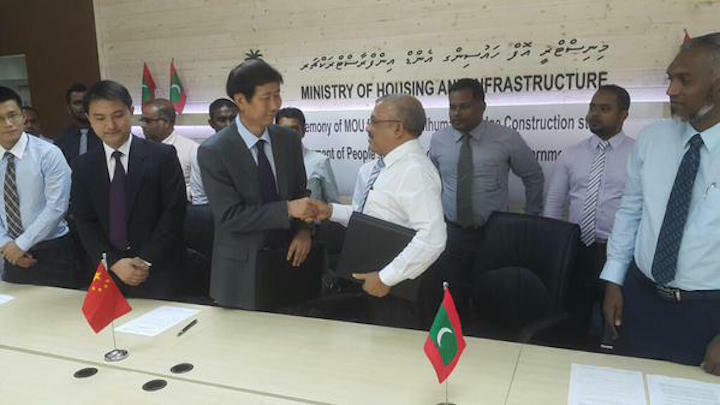 The hotel development project on the Nasandhuraa plot was awarded to Galaxy Enterprises five years ago. The large plot of land also accommodates the state-owned Island Aviation Services’ head office, which has now been provided new premises to move its operations, said Lirar. Island Aviation’s head of administration Ali Nashaath told Minivan News that the airline will be moving its headquarters to the vacant Raiveriyaa restaurant in the western end of Malé. “We never had our own land to operate from for the past 15 or so years. So we are planning to develop the Raiveriyaa site as our permanent headquarters,” said Nashaath. 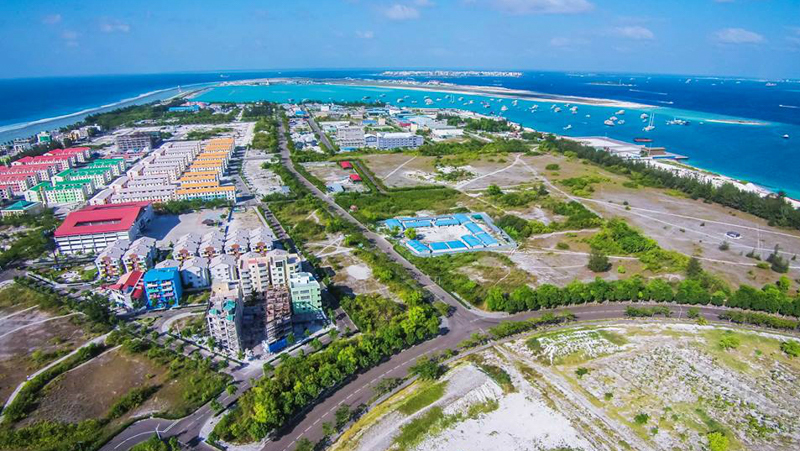 Haveeru reported that the cabinet’s economic council last month had requested Island Aviation to move out from Nasandhura, after transferring ownership of the plot of land from the housing ministry to the tourism ministry. Asked about the bidding process in the hotel development project, Lirar said the tourism ministry followed all due procedures. “The government will decide what happens to the land as it is government-owned. We will employ it in ways which would provide the maximum benefit to the government,” said Lirar. Four resort workers were dismissed on June 6 from Alif Alif Atoll Kandholu resort on bogus drug abuse charges because of their work on a petition demanding a minimum wage, the Tourism Employees Association of the Madives (TEAM) has said. “All four of the dismissed staff were key figures in gaining signatures for the TEAM petition. The resort wanted to dismiss them with any excuse they could find,” said the organization’s secretary general Mauroof Zaki. 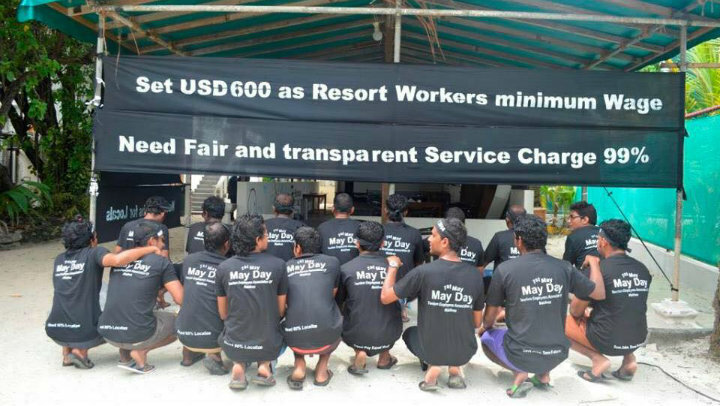 The TEAM petition – signed by more than 5000 Maldivian resort workers – demands a US$600 minimum wage, the implementation of an eight percent quota for Maldivians in the resort sector and the equal distribution of service charge to all employees. Police raided Kandholhu resort – owned by Universal Enterprises – after the management complained of staff using drugs on the island. A police spokesperson said the four were taken to Rasdhoo Island for a urine test. Two of the staff tested positive on a drug screening. But the police said they were released the next day because the substance they had used was not illegal. The dismissed staff told Minivan News they were using medication. “The police started checking our belongings and doing body checks of the people singled out by the management. They checked me and said I was clear of any problems,” he said. Resident manager Ahmed Jaleel told Sameen to accompany the police to Rasdhoo. When the drug test came out negative, Sameen said he was taken to Kuramathi resort, also owned by Universal Enterprises, and informed of his dismissal. The letter was signed by Jaleel. Jaleel told Minivan News that he had did not made any promises to reinstate staff and said he was not aware of their work gaining signatures for the petition. Jaleel and the Kandholhu general manager were not responding to further calls despite repeated attempts. Over the past few years, resort workers have occasionally tried to launch protests. Workers who had been fired from Sheraton’s Maldives luxury resort for allegedly demanding union recognition protested near the Sheraton Maldives Full Moon Resort and Spa in February, according to the website of the International Union Federation. Carrying banners with slogans such as “Sheraton fully booked — no room for human rights”, the dismissed workers carried out a boat picket around the resort, while employees came to the beach and waved in support. Three staff at Palm Beach were dismissed in July 2014 after 50 staff staged a strike over alleged discriminatory polices at the resort. In February 2013, an employee strike in Vaavu Atoll Alimathaa resort resulted in 27 employees being fired by management.